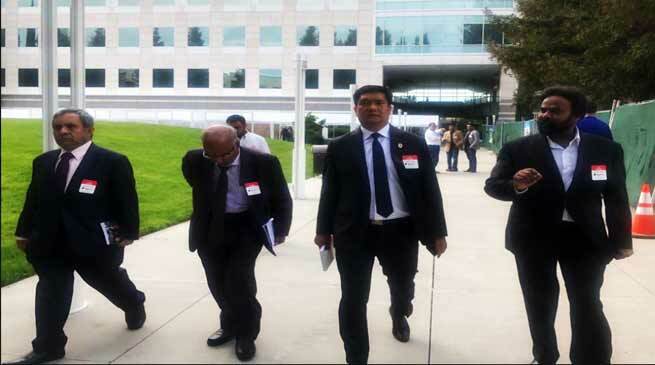 Chief Minister Pema Khandu today visited PayPal headquarters – the famed digital e-commerce platform – at San Jose, where he was given an exclusive guided tour on the innovations being undertaken by PayPal and also the future of digital transactions involving very high degree of data encryption and protection of individual data. Later in the day, the Chief Minister had a one-to-one interaction with Prof Solomon Darwin and discussed wide ranging issues on development of the state. Prof Solomon has undertaken a self-financing model of smart villages in Andhra Pradesh – for empowering the under banked and underserved sections of the population in the rural areas with use of technology. Khandu and Prof Solomon of Berkeley University in principle agreed to rollout a similar smart village initiative in Arunachal Pradesh by dovetailing the CM Adarsh Gram Yojana. A delegation is expected to visit the state shortly. Visibly elated Khandu specifically mentioned that with a predominantly rural population in the state – empowering the villages will usher in inclusive development in the truest sense. Prof Solomon is the Executive Director, Garwood Centre for Corporate Innovation and currently works in UC Berkeley. He is known as ‘Father of the smart village movement’ and developed scalable models that support rural village markets by aligning global brands, start-ups and local cottage industries to form a better future. His work in Andhra Pradesh by aligning corporate giants including google, IBM, Ericsson, pay pal and Cisco has made the smart village movement a reality. Delegation of Chief minister included Ambassador V Ashok, Chief secretary Satya Gopal and others.